Currently, I’m running a T-Rex Tonebug Fuzz give away (full details here). A few of you emailed asking what the pedal was all about. Well, good thing we demo’d the pedal! The great people at T-Rex were kind enough to send over a few Tonebugs for EffectsBay to demo, so I want stop and say thanks to T-Rex! If you get a chance, please check out T-Rex Effects for their complete listing of awesome guitar/bass pedals! So let’s get down to the nuts and bolts. The T-Rex Tonebug Fuzz has three basic controls. So what’s the deal with the Tonebug series? T-Rex has been pumping out some great pedals since 2002, and probably their most sought after pedal is the Replica Delay. Great quality with excellent detail to tone and effect, which also came with a equivalent price tag. With the Tonebug series, the folks at T-Rex wanted to achieve the follow – “to provide the best effects on the market for reasonable money.” The Tonebug series has been growing ever since. For this demo, I again enlisted the help of Jimmy Rolle. Jimmy is playing is Gibson Les Paul Elegant Custom Shop guitar into a Rivera Knucklehead 100w head through a Marshall 4×12 cabinet. The cabinet is mic’d with a Shure SM57 and Fathead Ribbon Mic. Nothing is between the guitar and amp except for the T-Rex Tonebug Fuzz. 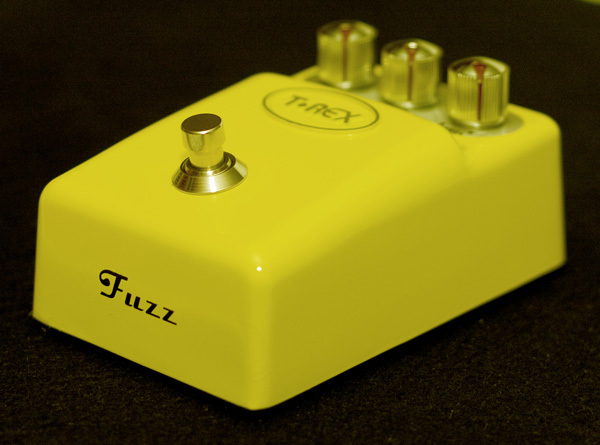 Now, as I mentioned, the T-Rex Tonebug Fuzz give away is still on. It ends on Monday 9/26, so be sure to get your entry in before it’s too late!